Ahh, Savannah Georgia. After exploring the streets of this historic town it’s easy to see why it’s known as the hostess city of the south. They’ve got t hospitality down to a T. From passerby’s on the street offering us the time left on their metered parking spot, to waiters letting us use their restrooms without purchasing something first, we didn’t meet an unfriendly face in Georgia’s oldest city. Fun Fact: Established in 1733, Savannah is brimming with nearly three centuries of history! 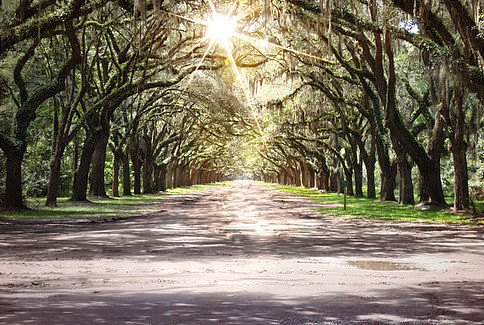 Known for it’s mile and a half long path of oak trees and Spanish moss, Wormsloe Historic Site is home to the tabby ruins, the oldest standing structure in Savannah. The ruins used to be the estate of Noble Jones, a carpenter who came over with the first English settlers in 1733. The site holds a museum and costumed interpreters reenacting historical events. Plus, the trees make for some great photography opportunities. Keep in mind that the site is closed Mondays, so plan your trip accordingly. The fountain pictured below is one of the most photographed sites in Savannah. Erected in 1858, the Forsyth Park Fountain is over 150 years old! Located at the north end of the park, you’ll find locals and tourists alike posing for pictures at this historic site. Stroll a little further south and you’ll find soccer fields and an outdoor amphitheater where concerts and events are held. This peaceful 30 acre park is the perfect spot to have a picnic or sit and people watch. For a complete list of upcoming events, click here. Fun Fact: Every St. Patrick’s Day, the water in the fountain is dyed green! Lined with beautiful white sand beaches, beach restaurants and bars, Tybee is a popular vacation spot for Georgians. Although it’s location 30 minutes east of downtown Savannah doesn’t make it convenient to see during a day trip, it can be done. This gorgeous island is a great spot to catch both sunrises and sunsets. We recommend ending your day of sightseeing by driving over to Tybee and grabbing some fresh, local seafood while you watch the sunset light up the sky and reflect off the river. If you have a few days in the Savannah area, we recommend taking a day just to explore Tybee. The river and wetlands that surround it offer great scenery for kayaking and stand up paddle boarding. We recommend renting kayaks and paddle boards through North Island Surf and Kayak. 4. Walk around River Street. Savannah’s open container laws allows for you to stroll the streets drink in hand (as long as it isn’t in a glass bottle). This makes the city a huge party hub, and it’s nightlife seen is wild. One of the most popular spots to down an alcoholic beverage is River Street. As the name implies, the street parallels the Savannah River and is dotted with bars, restaurants, and touristic shops. Even for non-drinkers, the local markets and beautiful back alleyways are sure to please every type of traveller. Be sure to grab some pralines over at River Street Sweets! 5. Cathedral of St. John the Baptist. Built in the early 1800’s, this Catholic church still holds masses in Latin every Sunday. Visitors are allowed to self-tour the church Monday-Saturday. Entry is free, but a small donation of $2 per person is appreciated. We love the clean simplicity of the architecture outside! Made famous by John Berendt’s novel Midnight in the Garden of Good and Evil, Bonaventure Cemetery spans nearly 160 acres. Take a stroll through this hauntingly beautiful cemetery on your own, or with a guided tour to gain a deeper understanding of the history held within the gates of Bonaventure. Established in 1753, this restaurant was originally an inn for seafarers, but quickly became a meeting spot for pirates, who would drink and tell stories of their travels. The tavern is claimed to be haunted, with an underground tunnel that runs to River Street. The tunnel was rediscovered in 1962, during renovations to the restaurant. Despite much speculation as to what purpose the tunnels served, their origins still remain a mystery. For more information and to see their menu, click here. If you have a knack for history and art, this house-turned-museum holds art collections previously belonging to the Owens family who resided there. Artifacts from Europe and America can be found dating back to the 1700’s. If museums aren’t your thing, then it’s worth stopping by for a quick photo op in the garden on your way to eat at The Olde Pink House, one of the most popular restaurants in Savannah serving low country cuisine. 10. Experience St. Patricks Day like no other. It’s a little known fact that Savannah is one of the top destinations to celebrate St. Patrick’s day. With the second biggest St. Patty’s Day parade in the US, Savannah celebrates not only on March 17th, but holds green-themed events all March long, making it one of the most popular times to visit the Hostess City. By Car. Savannah can easily be seen in a day by car — just be sure to pay attention to one-way streets, as there are A LOT of them here! It’s also worth noting that if you do decide to go by car, be prepared to pay for parking. The typical cost for street parking is 25 cents per fifteen minutes, or $2 an hour in metered parking lots. This is how we chose to see the city, but if you’re without a car or prefer not to navigate the city streets this way keep reading for more site-seeing options. By Trolly. Savannah’s Trolly Tours provide an excellent way to see the city in a day. With 15 stops at all of the main attractions, unlimited hop-on-hop-off, and a 100% money back guarantee this is the option for travelers who prefer not to plan out their trips but to have someone else to the work for them. The price is $33 for adults, $12.50 for children, and children under 4 ride free. By Bus. Savannah has a $3 day pass that gives access to their local bus system. This a great option for those who don’t have a car and who are on a budget. You can find more information on schedules and bus routes by clicking here. Have you ever been to Savannah? What was your favorite thing about this historic southern town? Have any recommendations on things to do/see? Let us know in the comments section below!